Control cards can take various forms, but all include numbered boxes for punching in at successive controls as well as spaces (not shown here) for the name of the competitor, the course and class, the start time, the finish time, and the elapsed time. For most orienteering events, starts are staggered so that no two people on the same course start at the same time. The intention is that each individual do their own navigation; following others is prohibited by the rules. The World Orienteering Championships and many national championships are based on one race. However, nationally sanctioned North American orienteering events usually take the form of two separate races on two separate days (often on separate maps) with the fastest two-day total time determining the winner, and the world's largest event, Sweden's O-Ringen, is a five-day event with the winner being determined by total time. Most events include a variety of courses ranging from the beginner level (easy navigation, about 3 km) to the top category (difficult, about 10 km). Larger events will also have different classes for males and females, as well as for different age groups. The standard orienteering event is a point-to-point race; controls are numbered on the map and connected in the order the competitor is to visit them. 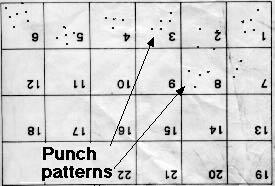 Upon reaching each control, the orienteer punches a pattern in the corresponding numbered box on the control card. This allows the event organizers to verify that the correct controls were visited. Sometimes an orienteer accidentally punches in the wrong box on the card; if this happens, the correct procedure is to punch in the correct box, and/or to punch in any of the boxes on the card that would not normally be used (for example, #20 could be used if the course has 12 controls) until punching in the correct box can be resumed (and it never hurts to explain what you did to someone at the finish line). This control card was used in North America. If it had been used in Sweden, where events are large and rules are more tightly enforced, the orienteer would probably have been disqualified - because two of the punches, #2 and #8, are not entirely within the box on the control card.